You’ve found your perfect teak furniture set, you’ve checked to see it’s in stock and you’ve had it delivered to your door, now you must look after it. Teak furniture requires careful handling to make sure your set stays as clean and as crisp as the day you bought it. The reason this type of furniture is so popular is because it is the highest quality of garden furniture available, which means it’s the longest lasting of all materials so long as it is taken care of. But many customers aren’t aware of correct teak furniture care methods before they buy it. So here is a quick 10 step-guide to keeping your teak furniture’s natural glossy gleam. Teak furniture is exposed to all the elements outdoors, come storm or shine so it can easily get damaged if due care is not taken. Here are the 10 steps you need to take. 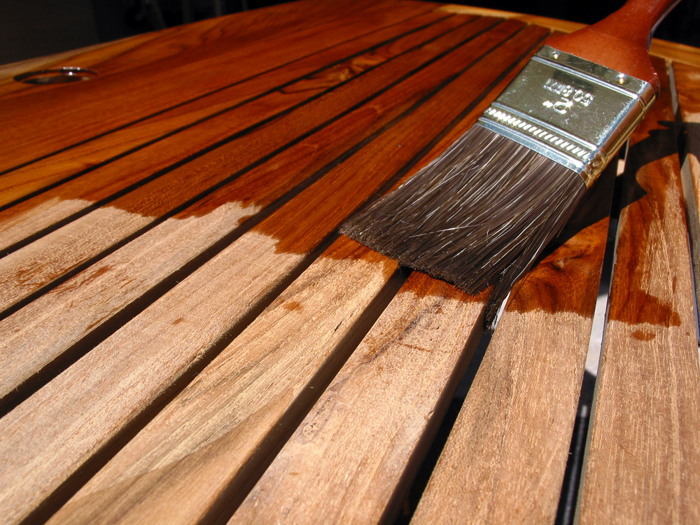 Protect your teak – Apply a layer of quality protectant such as teak sealer to your furniture. This will prevent oxidation of the outer layer of wood, so it won’t turn grey. Teak wood contains natural oils that give the furniture its honey colour, but this will only last a few weeks if the wood is not treated and protected. 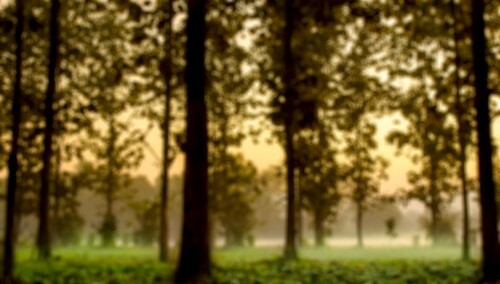 Storing your set – weathering of teak takes approximately nine months if furniture is left outdoors. Weathering will turn your teak a silvery-grey discolouring. Store your furniture in designated furniture storage units, your garage or shed. Do not move teak furniture from gardens into heated indoor rooms as temperature differences may cause wood to split. Do not move teak furniture from garden into heated indoor room for storage as temperature differences may cause wood to split. Sanding – lightly sanding your teak furniture is the best way to preserve its natural golden colour. It can also help get rid of stains and smooth off rough edges, that naturally occur as a result of weathering. Washing – teak requires a gentle approach, so put down your pressure washer and get the drizzly garden hose out. Hose down your teak once every 2 or 3 weeks. Take cover – If you do choose to leave your teak furniture to fend for itself against the elements, then you should at least give it the respect it deserves with its own outdoor furniture cover. Security – Teak furniture burglaries are an uncommon, but terrible occurrence. Don’t let it be you. Securing your furniture against burglaries is simple. Keep your garden entrances sealed and garden doors locked. Also, don’t brag about your beautiful teak set to your friends and colleagues, their jealousy might get the better of them. Flooding – In case of flash floods consider fixing small buoyancy aids with your written address to your teak furniture so that it will stay afloat in high tides or when river banks bust. Then you’ll stand a better chance of being reunited with your beloved set once things get back to normal. Natural disasters – If you live near an active volcano, volcanic eruptions may be a risk to your furniture. Due to the highly-flammable nature of teak you don’t stand a good chance, but if you have time, move your furniture to your roof to help it avoid encroaching lava slides. 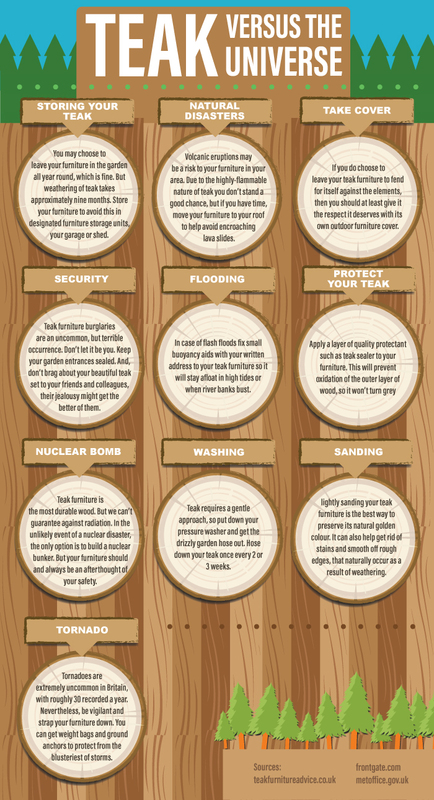 Nuclear bomb – Teak furniture is often considered the most durable of all woods. But we cannot guarantee durability against radiation. In the unlikely event of a nuclear disaster, there is very little you can do to protect your teak furniture from radiation. The only chance you have is to build a nuclear bunker in your back garden. But, your time is probably limited in the event of a nuclear attack, and your furniture should and always be an afterthought of your safety. Tornado – tornadoes are extremely uncommon in Britain, with roughly 30 recorded a year. Nevertheless, be vigilant and strap your furniture down. You can get weight bags and outdoor furniture ground anchors to protect from the blusteriest of storms.